New Zealand is truly the nexus point for fantasy lovers and futurists' dearest dreams. First it hosted Hobbiton, and now it’ll serve as the first major testing ground for a professional flying car company. Kitty Hawk, an autonomous air taxi company founded by Google co-founder Larry Page and run by former Google VP Sebastian Thrun, revealed today that it has reached an agreement with New Zealand PM Jacinda Ardern to publicly test autonomous flying vehicles in the country's airspace, in the hopes of certifying a commercial taxi company within three years or less. Nicknamed Cora, Kitty Hawk’s self-flying, fully electric aircraft is a plane/drone hybrid: it’s capable of Vertical Take-Off and Landing (VTOL) without a runway (like any drone), but once airborne, it uses its 36-foot wingspan and a dozen battery-powered rotors to fly. Cora can carry two passengers at once, and will elevate between 500 and 3,000 feet above the ground for its flights. It can travel about 62 miles / 100 kilometers per trip, and hits maximum speeds of 110 mph / 180 kmh. As for how Kitty Hawk's self-flying tech works, we haven’t seen anything revealed yet. 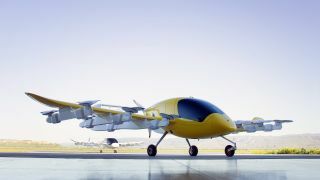 Considering it took eight years to reach this stage, and that it's in competition with several other air taxi manufacturers like Uber Elevate, Airbus, Ehang and others, it's not likely that information will be made public anytime soon. Due to its relative isolation from other nations and long stretches of uninhabited land, New Zealand is the perfect testing ground for Kitty Hawk to prove its tech works without getting in the way of commercial planes or endangering people on the ground. Larry Page has made it clear, though, that his Mountain View-based company would like to bring its taxis to the US and EU, once New Zealand has shown these governments how the certification process could work. Current regulations in the US would make a Kitty Hawk taxi service impossible. The FAA has “light-sport aircraft” guidelines that require drone-like aircraft to be relatively light, but have heavy safety features that make the aircraft compliant with the National Highway Traffic Safety Administration’s rules of the road for when it lands. Plus, as of now, no light-sport aircraft can be used for commercial purposes. And this isn’t even addressing how federal and state regulations will deal with certifying the self-flying technology. As we recently saw in California, US state governments have shown some willingness for companies to test autonomous driving technology, so long as cars are following the rules of the road. But flying above the road is a whole new regulatory category for governments to unwind. In other words, unless you live in New Zealand, don’t necessarily count on climbing into an autonomous air taxi anytime soon. But, if Kitty Hawk impresses the world in 2021, regulations could slowly morph into making the fliers an international reality.